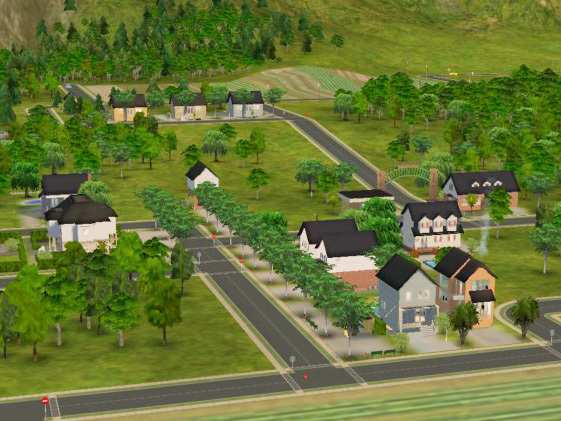 A perfectly mainstream middle-class suburbia in an idyllic location next to the shore, complete with lots but no sims. With a bit of pre-christmas decoration in most of the lots, because I like the Maxis Poinsettia and .. well, look at the calendar =). Middleground is centered around a museum and park with city-ish houses down Main Street, older country style houses in Riverside Drive (to the right of the picture) and newly-built family starters in Forest Lane up the hill. There's also an oldfashioned cottage in the woods, two beach/holiday houses, and one house in Dieffenbach Boulevard (down the left side) where I imagine more upperclass houses and villas could be built -- behind the loop at the end of the street would be a perfect location for a small castle or oversized mansion. The street layout of Middleground is small (no cameramod needed), but still with room to expand. The neighbourhood is 100% flat in the buildable areas; the sc4 terrain (available as a separate download below) is flat in the central part but may have slopes elsewhere. Middleground will install as N514. 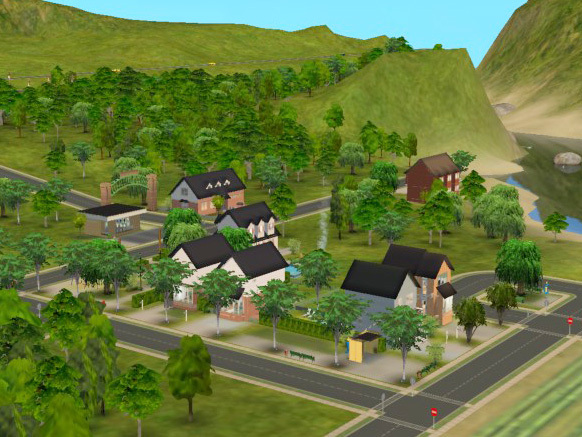 Made with the Empty and Cleaned-up Templates by SaraMK and Argon @ MATY -- it contains no playable sims, townies, NPCs, or other traces of sim life. Pets users: if you don't want your game to generate random pets when you start playing, the thread on MATY has an empty Pets template too. 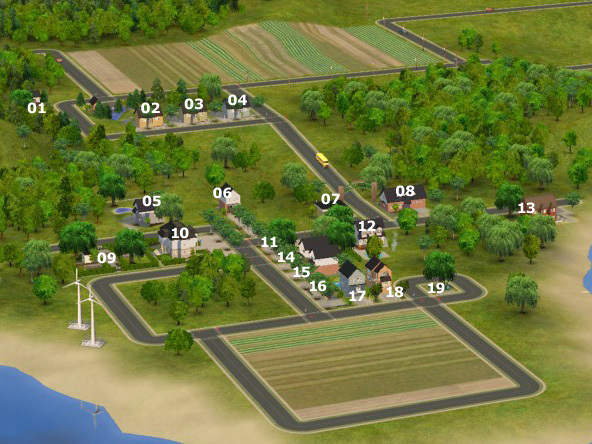 Middleground comes with 6 community and 13 residential lots, 6 of them starters; see follow-up posts for pictures and detailed descriptions of each one. The lake in the upper left corner is not included, that's the "Swimmable Lake" from this thread (base game compatible). Most of the lots are rather small, between 1x1 and 2x4. The largest ones are 3x3 (the cemetery and the museum). 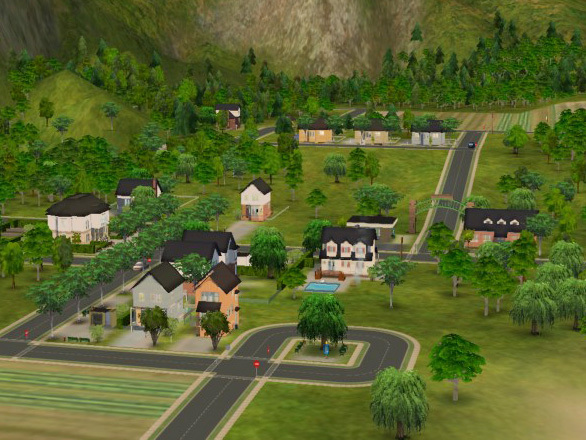 All residential lots have a garden and are furnished for at least 2 sims. Every house includes the usual starter equipment (double bed, table and seating for two, bookshelf, lights in all furnished rooms and outside, toilet, bathtub or shower, fridge, kitchen sink, phone, trash can, smoke detector, burglar alarm -- most of the houses have some extras on top) and has room for at least one driveway. Playtested in the Base Game, Base+NL, and Base+Seasons. 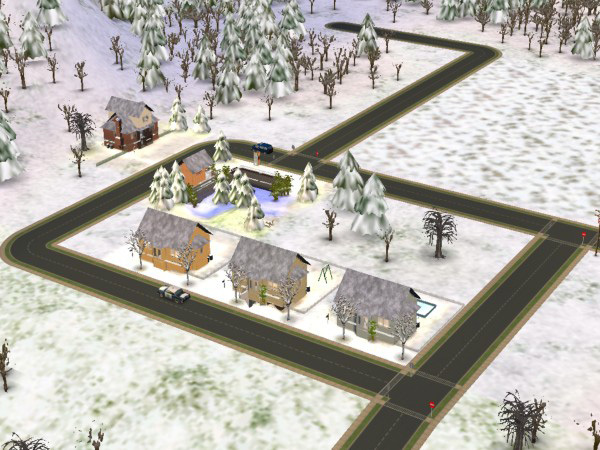 Snow and other weather effects on the screenshots are a Seasons feature -- there are no custom terrain paints or snow decorations included. Community lots are not playtested as owned businesses, only as visitable lots. 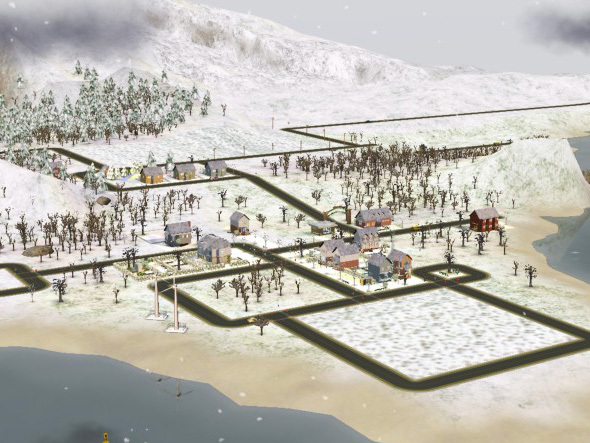 All lots are tested for adequate lighting at night and are landscaped to a reasonable degree (there's not just blank terrain underneath the snow). 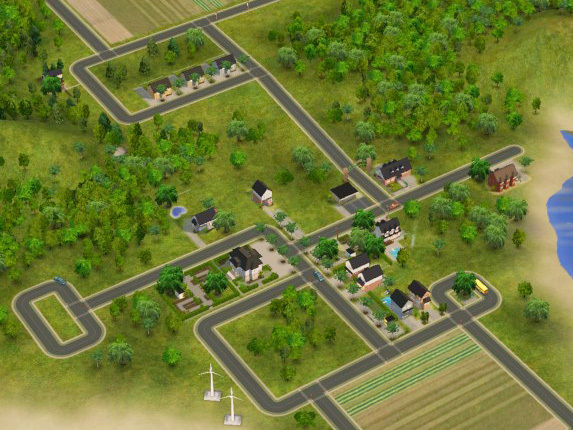 Middleground should work for everyone -- it's made in the Base Game, residential lots are prepared for NL with room for driveways, all lots are playtested in Seasons for weatherproofness, gardens are easy to fence off (if they aren't already) against strays/pets, businesses are ready for OfB with lockable areas and staff toilets. I hope that BV users will be able to place at least a few beach lots somewhere; this I can't check out myself so if it doesn't work you'll have to build non-BV beaches instead (get frillen's floortile hider if you do, it really makes a difference). 3. Start your game: Middleground should appear as last entry in your Neighbourhoods menu (unless you already have one that has a higher number). Middleground will be N514. Please make sure that your N514 folder ends up in the /Neighbourhoods folder *directly*, not inside a subfolder! (thanks to JessieBee185 for catching that one). In case you already have a N514 hood, rename the folder you downloaded from here and all files inside it that start with "N514_" (the ones in the Lots and Thumbnails subdirectories too) with a number that you don't already use. Anything up to "N999_" works, in my experience. 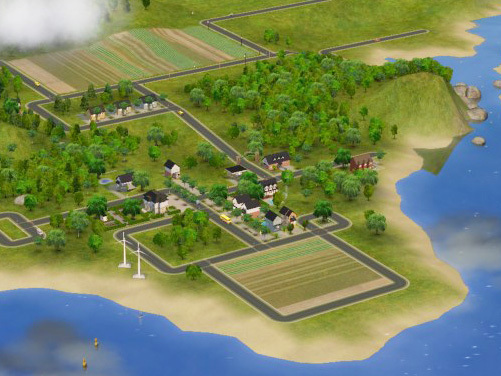 Alternatively, if you want this to be a subhood for example, or if you want your default townies in it, you can also install the hood as above, then use the sc4 terrain to make a new empty (sub)hood, move the houses over to that one and delete Middleground. For two people, lots #15 and #17 (3 Main Street and the blue one in Langerak Drive, number 1 or 2 or whatever) didn't show up in the neighbourhood -- if you have the same problem, you can download them separately from post #53 of this thread. I'd reupload the whole thing if I knew what the problem actually is, but right now I don't (if you've got any ideas, please post). Please see the threads linked above for installation instructions -- the lots will work just fine if you don't install the stairs properly, but you won't be able to select or change them or use them in other lots (they won't show up in the catalogue, which is what the installation procedure is for). - Everyone involved in the LotExpander/LotAdjuster development: without you, the nonstandard lot sizes in this hood wouldn't have been an option. Please don't PM me with downloading issues or build mode problems (post in the appropriate forums instead) and don't ask me for sc4 files or Body Shop content (I do lots and won't consider anything else). Any feedback related to this download, please post here instead of PMing me. Thank you. 2827 people have said thanks to plasticbox for this download. At the Seaside - Small sunny neighbourhood terrain for lots of beach lots!